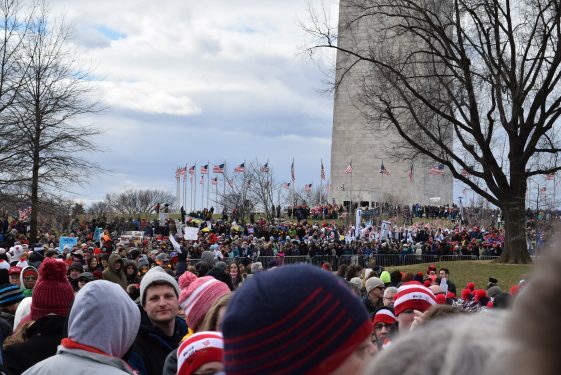 WASHINGTON, D.C. – During the same week the United States commemorated Dr. Martin Luther King Jr., Cardinal Timothy Dolan of New York invoked his legacy at the National Prayer Vigil for Life on Thursday, saying that pro-life activists share the same cause as King in their quest for civil rights. “Our prayers and witness are about civil rights, the right to life, and to equal protection under the law, guaranteed by our constitution, for the most fragile, marginalized, and threatened: the tiny, innocent baby in the womb,” said Cardinal Dolan. “Like Pastor King, our belief in the dignity of the human person and sacredness of human life propels us to concern for human life wherever, whenever, and however it is threatened, from racism to immigrants, from the war torn to the hungry,” he continued. Cardinal Dolan serves as head of the Committee for Pro-Life Activities for the United States Conference of Catholics Bishops (USCCB), and as is custom for that position, served as principal celebrant and homilist for the Mass. The National Prayer Vigil for Life occurs each year on the eve of the March for Life, an annual event in protest of the Supreme Court’s decision in Roe v. Wade, which legalized abortion throughout the United States. The annual Mass always brings together an impressive number of prelates and priests, with nearly 40 bishops and over 260 priests joining in the 15-minute procession at the start of the Mass, which took place at the Basilica of the National Shrine of the Immaculate Conception in the nation’s capital. Cardinal Donald Wuerl of Washington, D.C., Cardinal Sean O’Malley of Boston, Cardinal Daniel DiNardo of Galveston-Houston, and Cardinal Theodore McCarrick, Archbishop Emeritus of Washington, D.C., all joined Cardinal Dolan in concelebrating the Mass. King’s memory served as a major thread throughout Cardinal Dolan’s homily, and he made specific reference to the pro-life work of Alveda King, who is the director of African-American Outreach for Gospel of Life, led by Father Frank Pavone of Priests for Life. “As Reverend King’s niece often reminds us, her uncle would be marching with us in the defense of unborn life were not the dignity of his own person and the sanctity of his own life tragically violated fifty years ago this spring,” he said. He identified four principal reasons in response: to advocate, to fight, to lobby, and to pray for the cause of human life. “As noble as our cause is, we are still ridiculed, dismissed, harassed, and snickered at by many in the media, considered unwashed by most of academia and Hollywood, and ignored and criticized by most in one of the two political parties,” he said. Cardinal Dolan said that despite such obstacles, discouragement must be resisted, and love and joy should serve as hallmarks of the pro-life cause. “As Pope Francis often reminds us, we are fools if we dismiss the power of Satan. So, you bet we are here to advocate, to be encouraged, to lobby, but we are also here, not as warriors but as apostles of life, apostles armed not with money, hate, or destructive words, but, as the Holy Father exhorts, with love and joy,” he said. Cardinal Dolan was elected in 2014 as head of the USCCB’s Pro-Life Activities committee – an appointment that commenced in November 2015. Archbishop Joseph Naumann of Kansas City, Kansas, was elected at the fall assembly of the U.S. bishops in Baltimore this past November and will succeed him later this year. In 1979, Maryknoll Brother Goretti Zill from New York planned the first prayer vigil before the March for Life. Since then, the National Prayer Vigil has gone on to become one of the most well attended Catholic events organized around the March. Cardinal Dolan remarked in his homily that both critics and supporters alike often observe that the tens of thousands who gather for the annual March are reminiscent of the peaceful protests organized by King.